wikimapia.org gives an excellent summary of the life of this building at 732 Broadway, New York City, as follows, "732 Broadway (New York City, New York) 4-story Renaissance-revival mercantile building originally completed in 1854 as a 3.5-story peaked-roof house. It was raised to four full floors in 1885. The building was given a completely new facade, designed by Bruno W. Berger, in 1900. It is three bays wide, with white cast-iron columns at the ground-floor, and projecting, black cast-iron angled show windows on the 2nd-3rd floors, framed by red brick piers. Between these two floors are black paneled cast-iron spandrels decorated with dentils and swags. The piers have black cast-iron capitals at the top of the 3rd floor supporting a broad iron lintel. The top floors has coursed brick and three round-arched windows with black iron architraves and impost blocks. The prominent black galvanized roof cornice has scrolled and foliate brackets, dentils, and script lettering reading "Treffurth's." At the time of the alterations, the building was leased to Richard L. Treffurth, whose restaurant occupied the ground floor. The upper floors were mostly leased to apparel and millinery firms. Over the subsequent years a variety of tenants came and went upstairs. Shampan and Shampan, architects, were here in 1916; the Grill Feather Boa Co. in 1921; and the F. F. Manufacturing Company, “knit goods,” in 1922. That same year William F. Crerand published textile trade journals here. In the meantime, the restaurant changed hands. By 1921 it was the T. L. P. Restaurant; and in 1937 it was home to the Ace Restaurant. The end of the line of the long string of restaurants came in March 1952 when the Wissman Estate leased the entire building to the Universal Musical Instruments Company. In 2004 the upper floors were converted to residential space. The ground floor is now occupied by a T-Mobile store." The NOHO Historic District Designation Report, NYC Landmarks Preservation Commission, June 29, 1999, includes, "732 Broadway (East side between East 4th Street and Astor Place). Borough of Manhattan Tax Map Block 545, lot 20. Date of construction: 1900 alteration of a pre-1854 building. Architect: Bruno W. Berger (1900). Original owner: Helen A. Wissmann (1900). Type: Altered dwelling. Style: Renaissance Revival. Stories: 4. Structure/material: Brick. Features: Three bays; panelled cast-iron columns at storefront level with non-historic infill, signage, and entryway to upper floors; cornice above storefront removed or boxed-in; second- and third-story projecting show windows with bracketed cast-iron columns, panelled galvanized iron spandrel decorated with dentils and swags, and galvanized iron crown molding with acanthus; historic and non-historic sash; flanking brick piers with stone bases and galvanized iron capitals and crown; fourth story has coursed brick and arched fenestration with galvanized iron architraves and imposts; prominent galvanized roof cornice with scrolled and foliate brackets, dentils, and lettering "Treffurth's." History: This store and loft building is the result of two major alterations of what was possibly an early nineteenth-century, three-and-a-half story peaked-roof house, which was raised to a full four stories in 1885. The building was given a completely new facade, designed by architect Bruno W. Berger, in 1900; the owner was Helen A. Wissmann, whose family retained possession of the building until at least 1924. At the time of the 1900 alteration, the building was leased to Richard L. Treffurth, whose business, Treffurth's Restaurant and Cafe, occupied the ground floor. 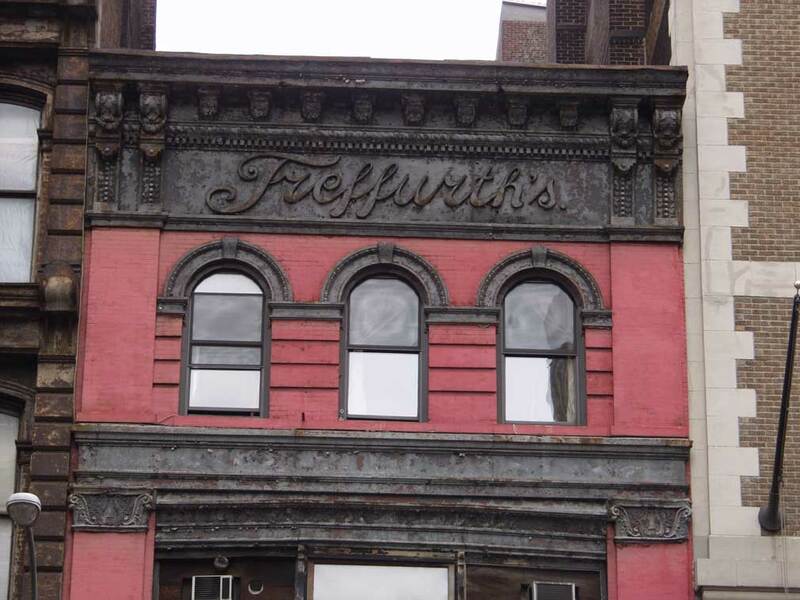 The name "Treffurth's" remains on the building's roof cornice. The building now houses joint living/working quarters on the upper floors." Also on the internet, daytoninmanhattan.blogspot.com includes a great deal of the building's earliest years; and the following regarding Treffurth's, "At the time No. 732 had passed from the Jones estate to Francis de Ruyter Wissman and his wife Helen. In July 1899 wealthy rice merchant W. H. M. Sanger surrendered the $300 a year lease of the building to Warren Tupper. Five months later Tupper assigned the lease to Richard L. Treffurth, a restaurant owner. Apparently as part of the lease conditions the Wissmans agreed to alter the building. In 1900 the Real Estate Record & Builders’ Guide announced alterations for 'Richard L. Treffurth, restaurant and café.' But building records show that it was Helen A. Wissman who hired architect Bruno W. Berger to renovate the structure. The resulting make-over was a handsome Renaissance Revival restaurant and loft building that obscured any hint that there was a house hidden away someplace. Brick side piers with cast metal capitals embraced two floors of cast iron show windows. Pretty arched openings at the top floor were trimmed in cast iron and a bracketed cornice finished the design. ... In 1906 Treffurth spent $550 to have a sign designed by architect C. F. Melville and attached to the building. That costly advertisement is most likely the name Treffurth’s in projecting script still seen below the cornice. ... It appears that around 1914 things became tense between Richard L. Treffurth and his landlords. In April the lease on the first floor and basement was given to Samuel Shapiro 'for a lunchroom' and on October 15, 1915 Helen A. Wissman filed suit against Treffurth. The suit ended in 'no opinion' and the appeal was withdrawn. Coinciding with Shapiro’s signing of the lease, Helen Wissman hired architect Louis A. Sheinart to 'reset' the store front, according to the Real Estate Record & Builders’ Guide on April 25, 1914. The renovations for the new lunchroom cost her $200. Shapiro’s restaurant would not be in the space for long, however. For 15 years the Schwab Brothers café and restaurant had operated from No. 747 Broadway, almost directly across the street, where they paid a yearly rental of $6,000 to the Sailors’ Snug Harbor. Now, in 1915, the landlord decided 'there would be no liquor selling on property of the society.' Schwab Brothers needed to move quickly. On September 14, 1915 the New-York Tribune reported that Schwab had rented the café and basement of No. 732 Broadway from Francis de Ruyter Wissman. 'Their new place is to be extensively altered to meet their requirements,' said the article." Treffurth's Restaurant was located at 732 Broadway from 1901 to 1914. The owner was Richard L. Treffurth (1856-1931). Treffurth was an immigrant from Germany and can be found in the U. S. Census in 1900, age 43, born November, 1856, Germany, immigrated 1883, living at 452 Amsterdam Ave. near 81st St. He can also be found in 1920 and 1930, as well as the New York State Census in 1925. In these census reports he lived on White Plains Road in Tuckahoe, N. Y. They indicate that he became a naturalized citizen in New Jersey in the mid-1880s.